Hello again, sweet friend. 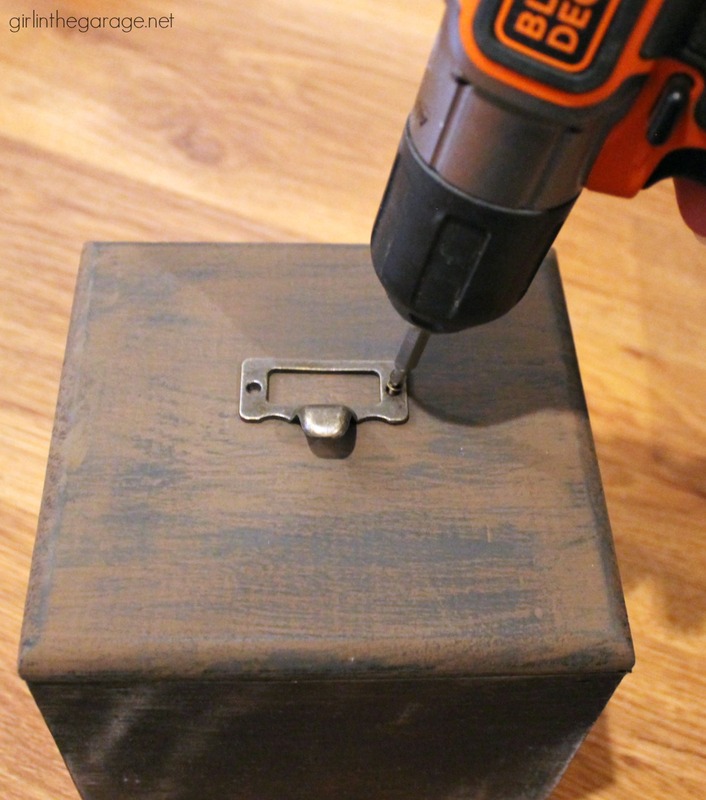 Today is Furniture Fixer Uppers day again with my talented blogging friends and I’m sharing the makeover of this interesting little storage cabinet and I’m showing you an easy way to paint furniture to look like stain. Sound like fun? Good, let’s get started! This piece was for sale in an antique shop for about $28. It had great potential with all those drawers for storage, yet it would fit perfectly even in small spaces because of its narrow design. 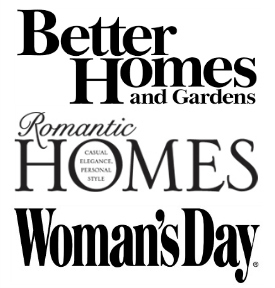 *This post contains some affiliate links so you can easily find the products I use and recommend. 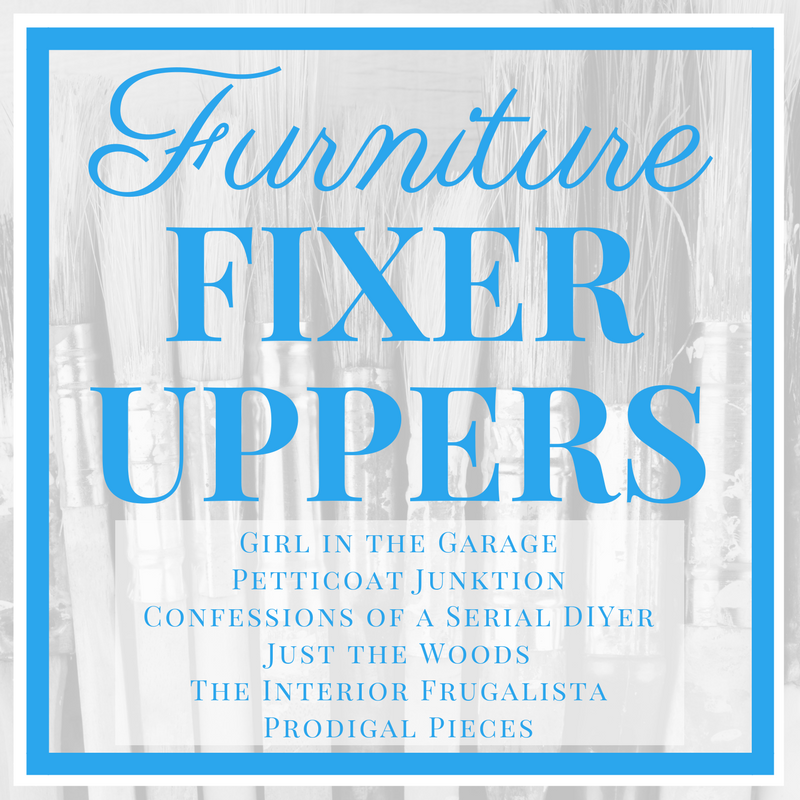 Learn more about all of my favorite products and tools for doing DIY projects Here. The first step was to remove all the old hardware. These were just screwed in with regular screws. Then the holes were filled with wood filler and left to dry for a few hours. 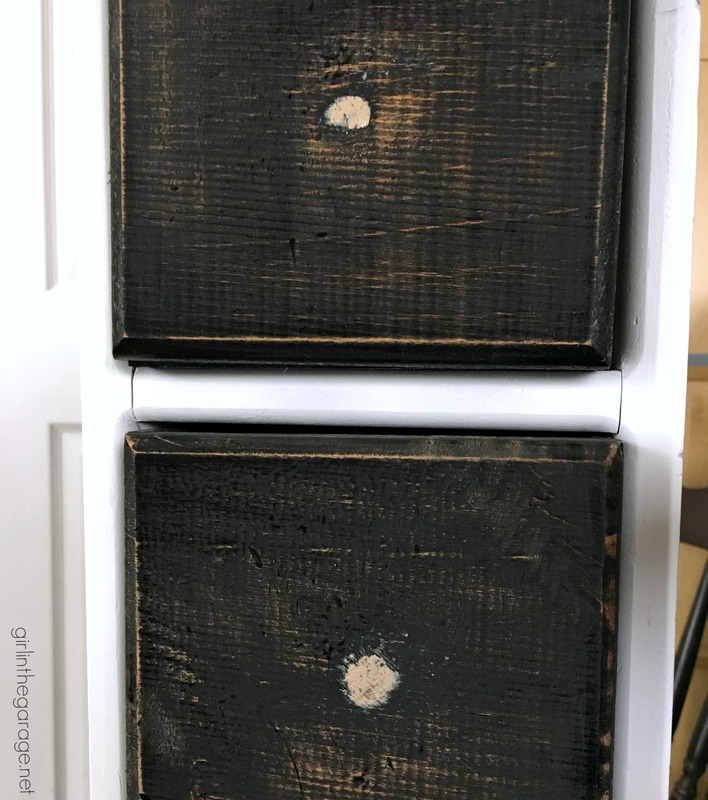 The drawers were sanded over with 220-grit sandpaper – not just the middle where the dried wood filler was, but all over to de-gloss the original paint so the new paint could adhere better. 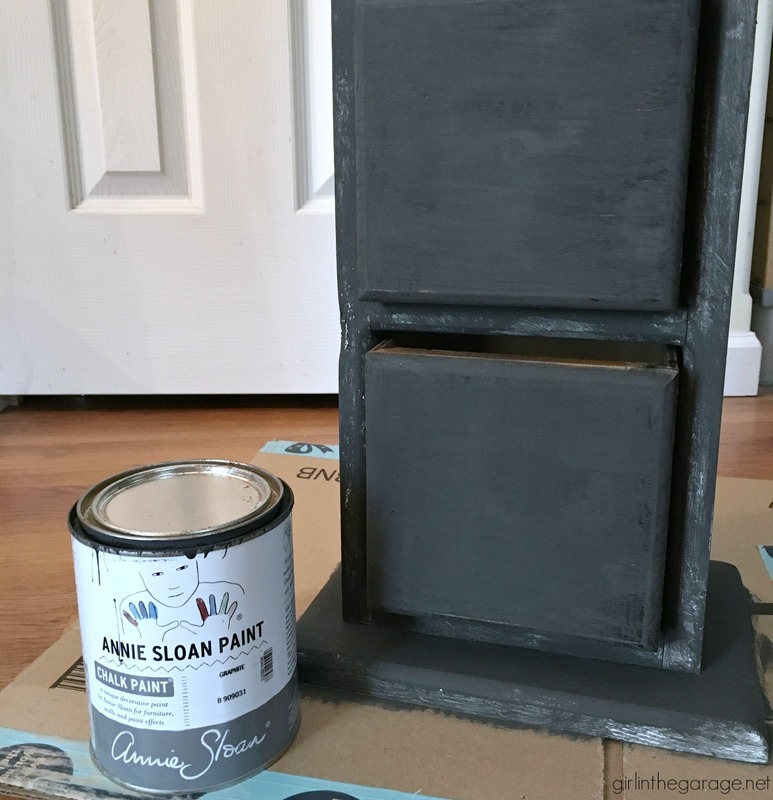 Next I painted everything in Annie Sloan Chalk Paint in Graphite with my favorite Purdy paintbrush to cover the white and so the base coat would be the same all over. 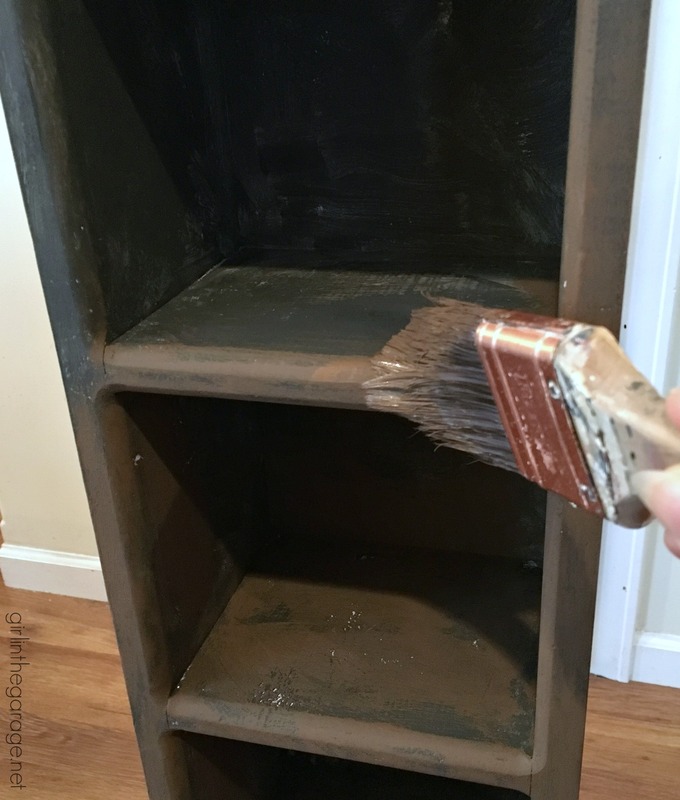 The next step in painting a faux stain finish on furniture is to paint the piece brown – in this case, Chalk Paint in Honfleur. 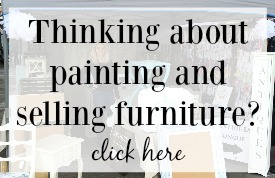 Let me tell you, for a long time I wouldn’t try brown paint because I thought it was really odd that someone would paint their furniture brown. I mean, it was brown wood to start with, so what’s the point of painting it brown? 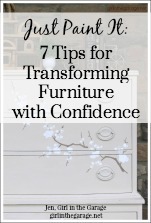 Then I bought Honfleur to use in one of the furniture makeovers for my upcoming book. 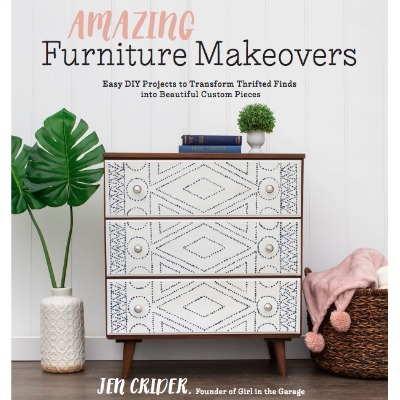 It’s actually a project where I paint a midcentury laminate dresser with a faux stain finish, and it’s a more advanced and detailed tutorial than today’s project (this is the cheater version, haha). Needless to say, I’ve become a fan of using brown paint in some projects like this one. Since we were having a winter ice storm outside and I was working on this in my kitchen, I didn’t do much sanding between coats. 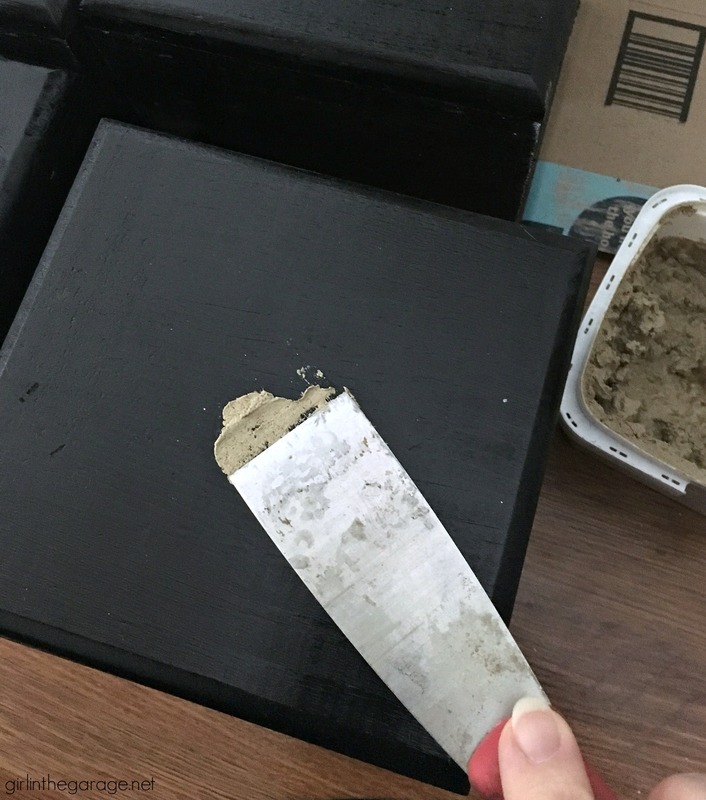 You can sand as much or as little as you want for a smoother or more textured appearance. 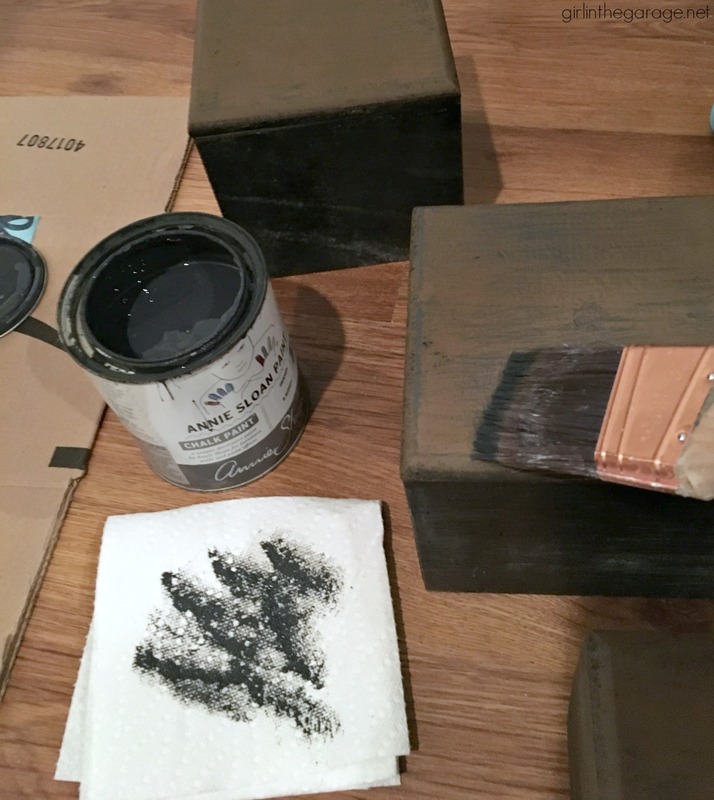 Follow up with a topcoat like Annie Sloan’s black wax for a more aged, rustic finish. 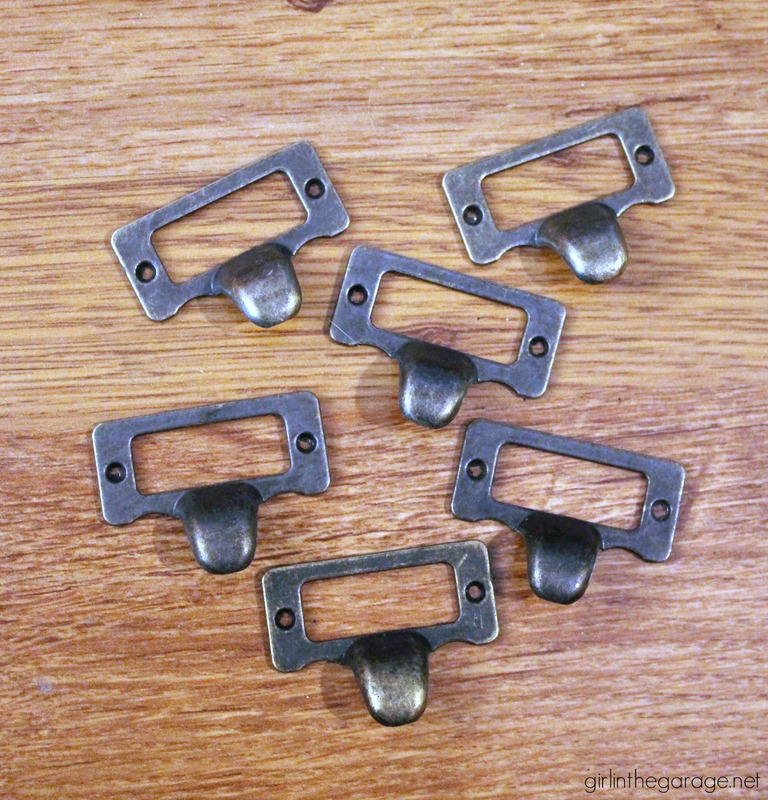 Finally: Card catalog drawer pulls! 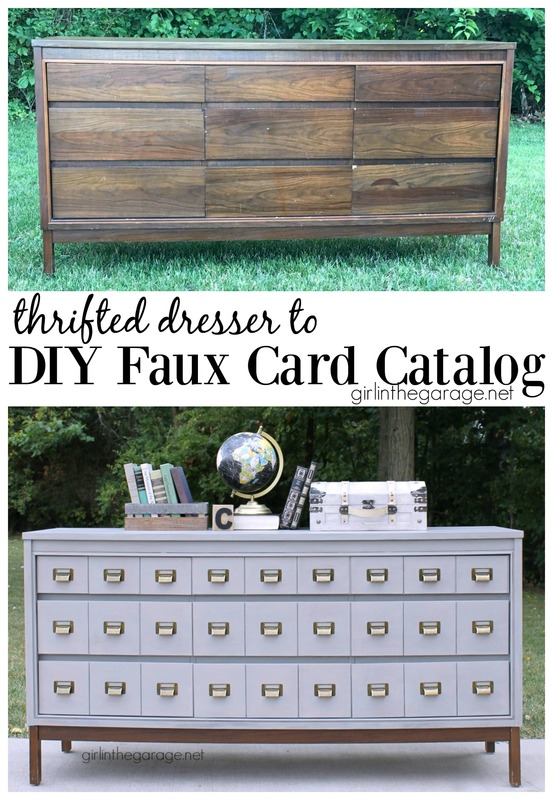 If you’ve been following me for any length of time you know how I looooooove a good faux card catalog. And they usually sell pretty well in my booth, so why not? 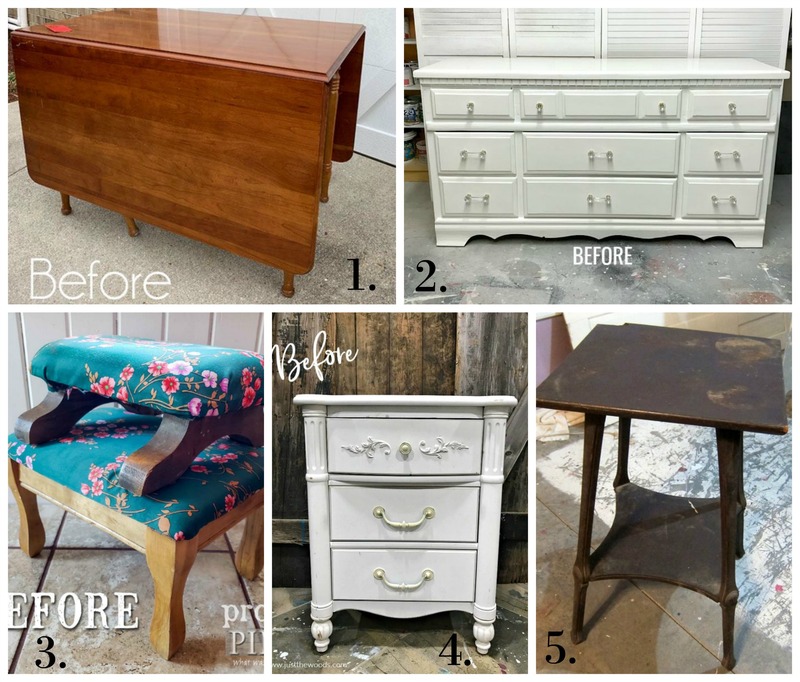 The square drawers and the faux stain finish are perfect for this type of furniture makeover. 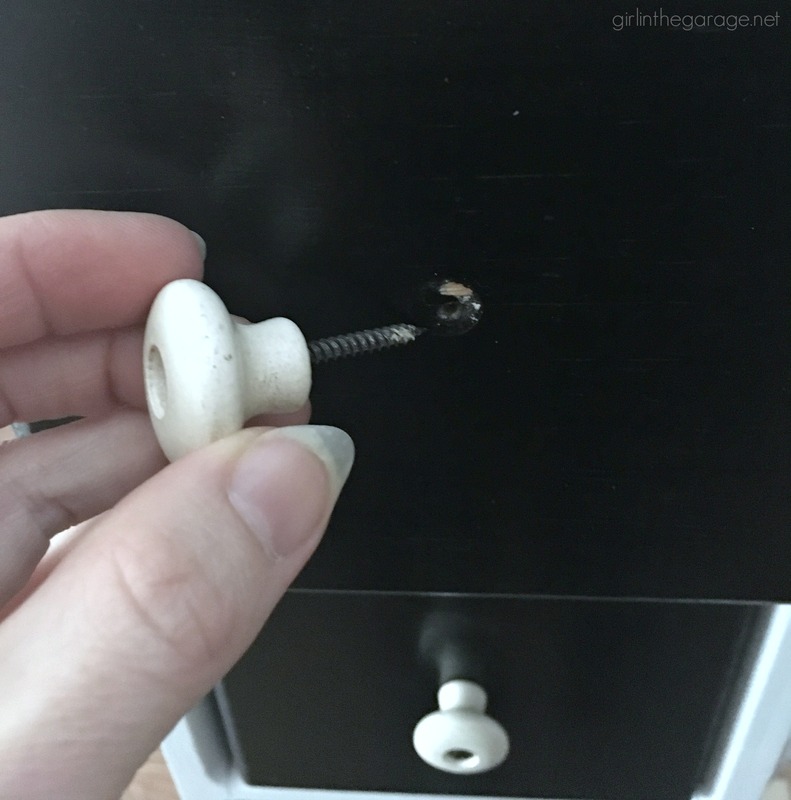 You can buy a pack of these card catalog pulls online Here for quite cheap, and they also come with the little screws you need. The screws went in super fast with my cordless drill/driver, plus no arm cramps from turning a screwdriver countless times. You might be nervous to try stain, for fear that it won’t turn out or you just don’t know how to use it. Truthfully I don’t work with stain much; Guy in the Garage usually handles the stain projects for me. For as easy as this technique is, I think it’s a pretty good fake! 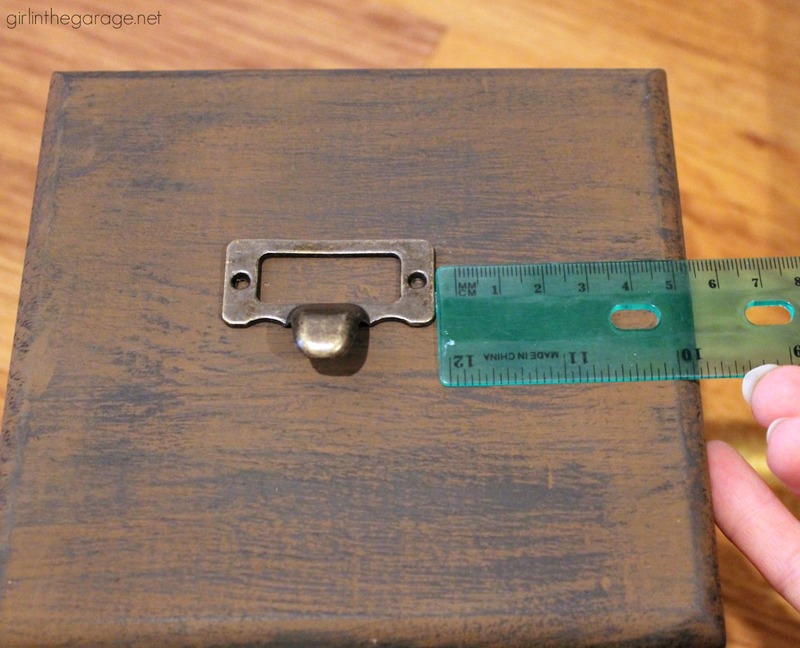 I don’t typically like redoing something that someone else has already painted, but this was a small simple cabinet that I really wanted to give new life as a faux card catalog. Sweet! 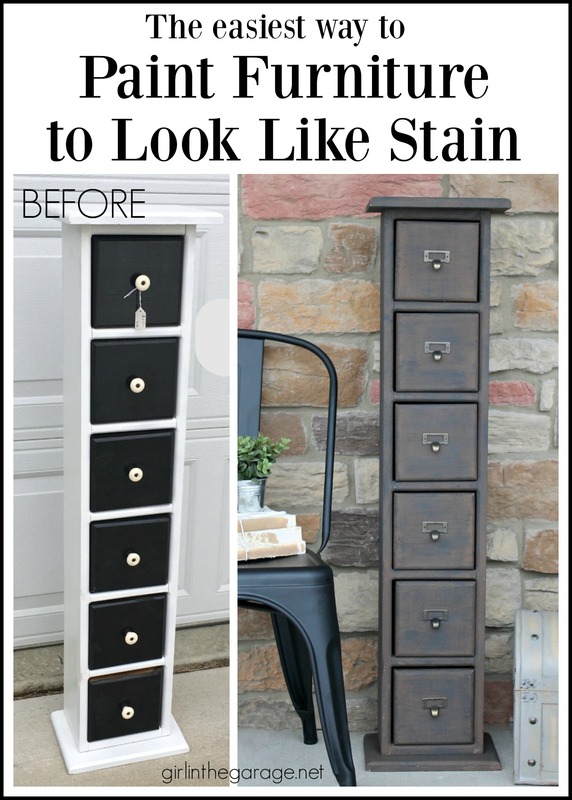 Using paint for faux stain is fun and this looks fantastic. It really does look like wood! When does your book come out? I know you have been hard at work on it. Wow! Love the makeover. Great job! 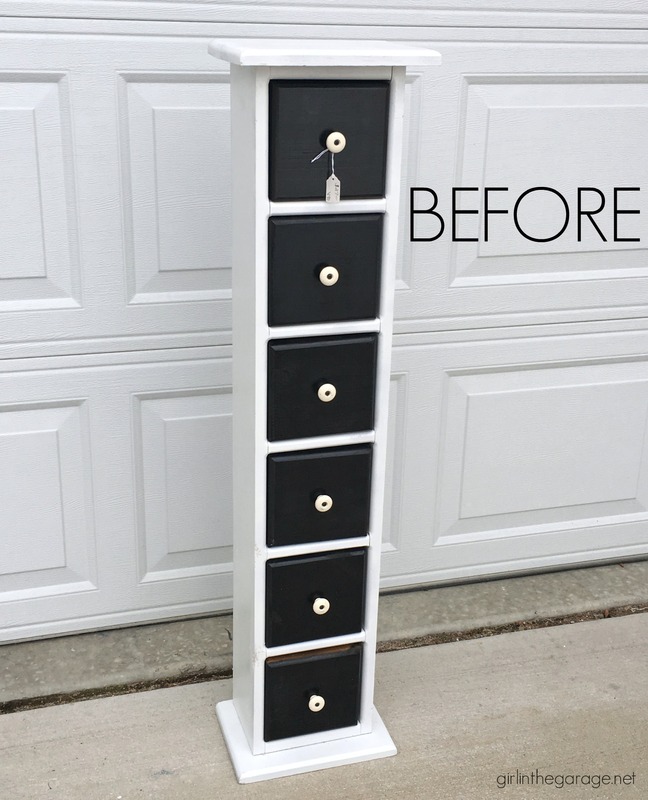 What a difference a little paint and new hardware makes, I love this piece now! Thanks so much for your sweet comment, Kaycee! I first thought the before was the after. The after after is way better and very cool. Brown paint — who knew? 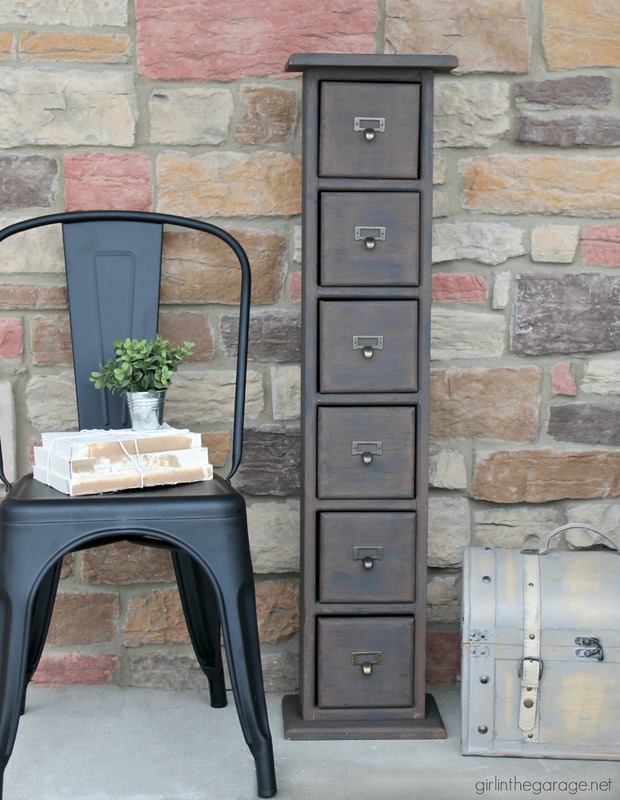 I love it….and a great “card catalog”!! 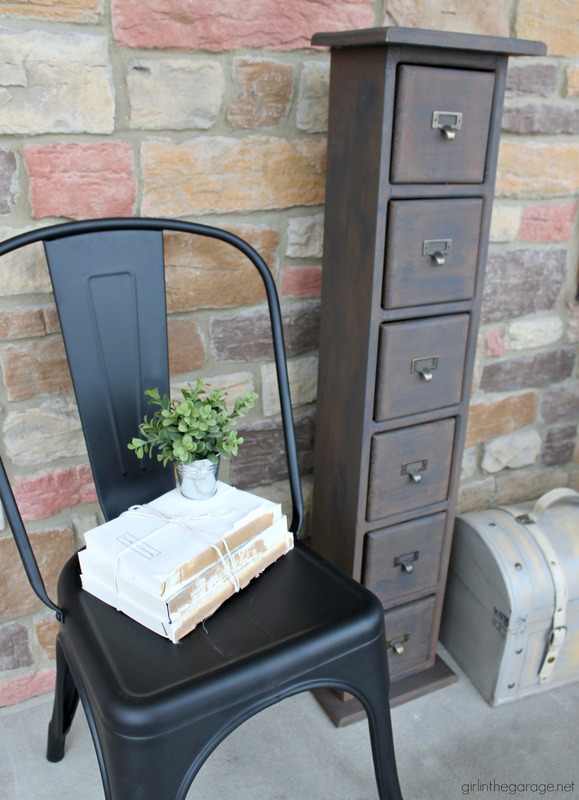 Where ever did you find this piece….I have been looking for something just like it! Hi Jen, I want to do a paint job like this one. 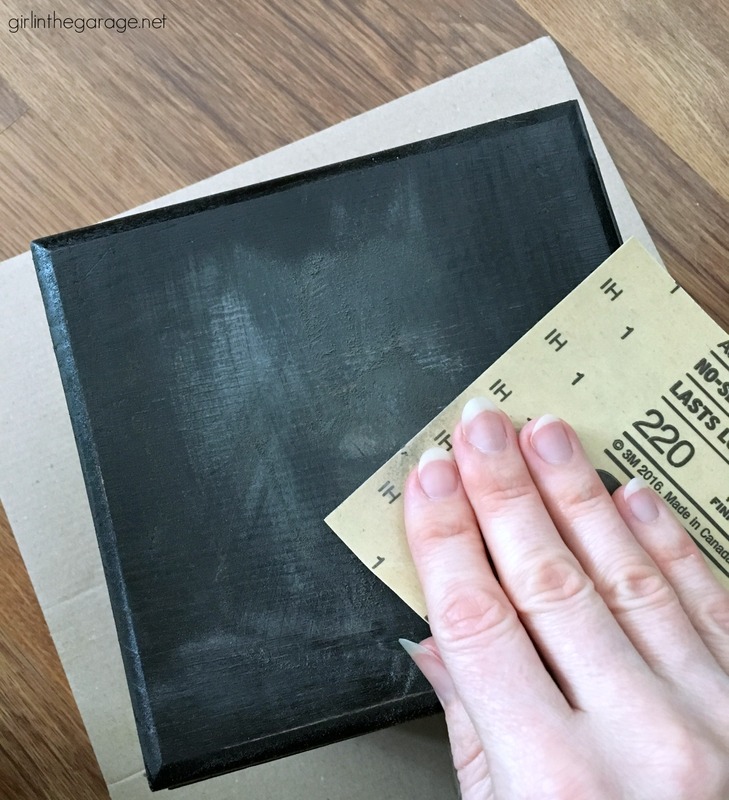 I have a dark green cabinet and want to dry brush with graphite. I will let you know how it turns out. You did a wonderful job. Thanks. 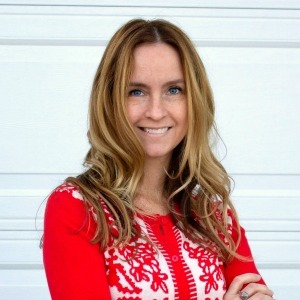 Thank you, Lori – yes please let me know how it turns out! 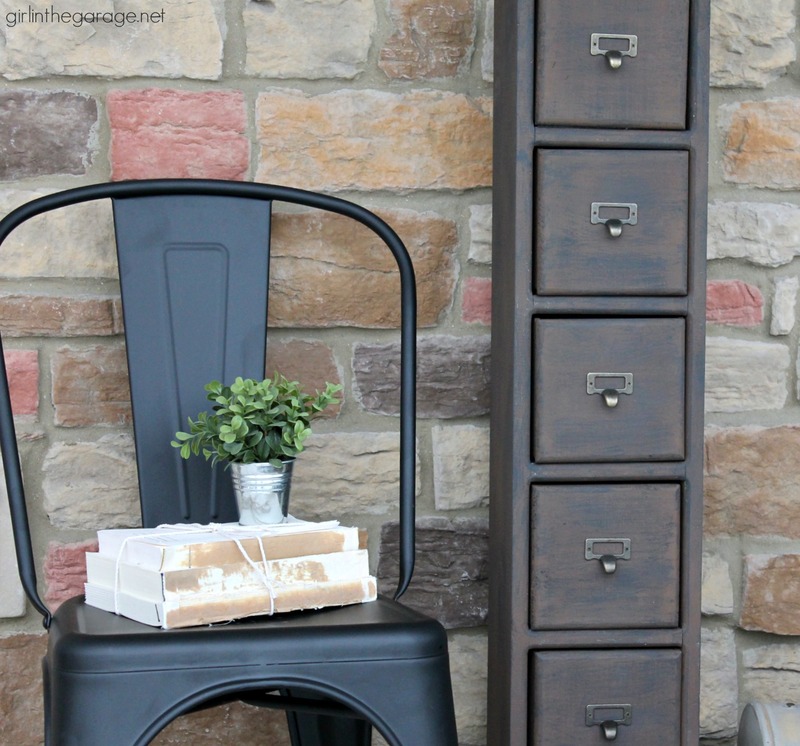 I have seen some gorgeous pieces done with Antibes (green) Chalk Paint and black wax. It really looks good! Thanks for sharing. 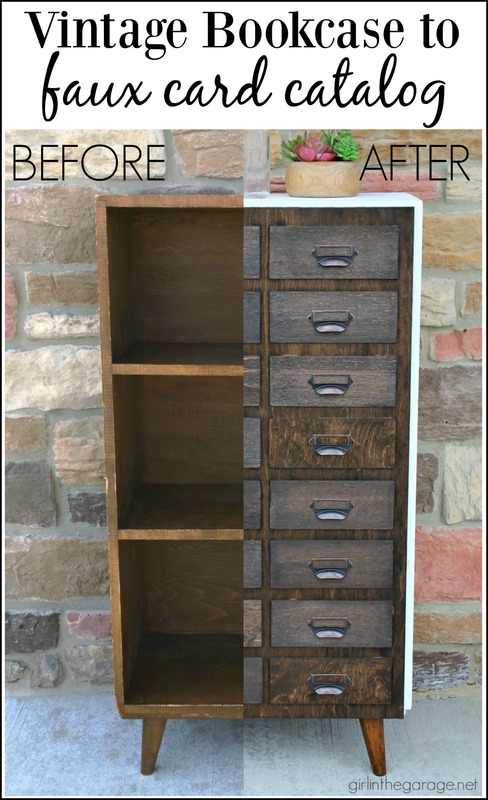 Jen, your make-over on that little cabinet makes it look SO much richer and up-scale! Amazing! Your technique is interesting to me and I’m anxious to find something I can use it with. Gotta get to the thrift store! Thanks for sharing this project. 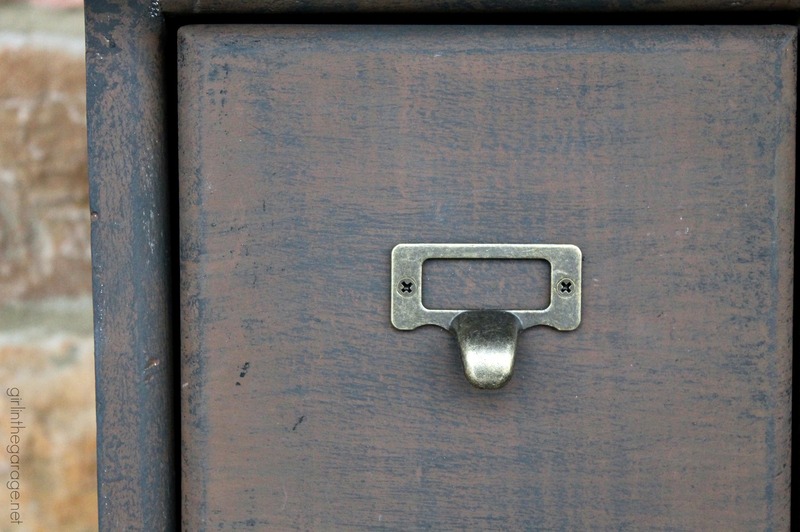 And I love the card catalog handles on it. They make the cabinet really unique.